I've been looking for a particular wood puzzle at stores and such for the last few years, and haven't been able to find it, so I finally decided to create a 3D model of it. Has anyone seen a puzzle that looks like this? The puzzle is roughly the height of an electric outlet, maybe a bit taller. 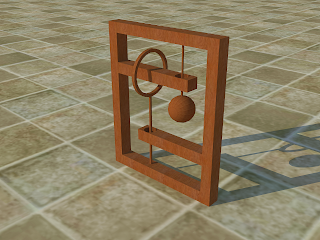 There's a loop of string with a wood ball on the end (the wood ball on the string is about the same size as the one attached to the end of the dowel in the puzzle), and the string loops around the lower end of the dowel with the ring on it. The objective is to try to remove the loop of string. I'll probably create a 3D model of the string as well, but string is so much harder to create than rigid objects. By the way, if anyone really cares, the image was modeled in Google SketchUp 7, and rendered in Kerkythea. A Google search should turn up the location to download and install those, if you're interested them. It took me about a half hour to model the puzzle, and it took the computer (no work by me during that time) about 10 minutes to ray-trace the image. If anyone wants the SketchUp source file, I'd be happy to provide it. Post your request as a comment, and I'll upload it.